This chapter describes and discusses the current situation in mathematics education in the countries of Southern Mediterranean Europe: France, Greece, Italy, Portugal, and Spain. Most of these countries feature decentralized education policies and include regions and school centers with autonomy to describe guidelines, materials, and resources. Nevertheless, the European Union has established some common guidelines and a guide to mathematics, among other subjects. They allow these countries to share some definitions and common concepts, together with some suggestions for procedures related to identification, assessment, and intervention when mathematics difficulties are observed in the classroom. 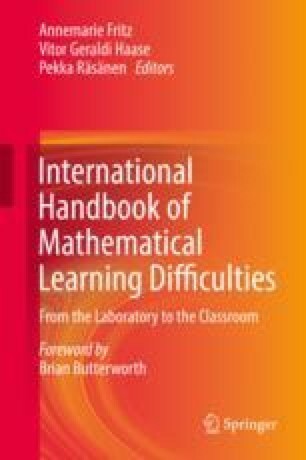 This chapter outlines the current policies, educational system, definitions of mathematics learning difficulties (MLD), diagnostic criteria, and some standard tests elaborated within each of the aforementioned countries and in their corresponding languages, along with some remediation resources. This chapter received financial support from the Department of Science and Technology of the Aragon Government. M. Gracia-Bafalluy would like to thank the following people for their assistance: Àngels Colomé, M. Isabel Núñez-Peña, Elisabet Tubau, and Eric D. Johnson, from the University of Barcelona, for collaborating in the preparation of the material related to the Spanish situation; Giannis Karagiannakis and Maria Chiara Passolunghi, for providing some material on Greece and Italy, respectively; Joan Oliart, head of the Indicators and Statistics Department of Education at the Generalitat de Catalunya; Pablo Santamaría, from TEA Editorial (Spain), for providing relevant information regarding their tests; and the designer Jakub Marian, for the elaboration of Figs. 11.1 and 11.2. Legifrance. (2016). Le service public de la diffusion du droit. In: Code de la santé publique. Available via Legifrance. https://www.legifrance.gouv.fr/affichCodeArticle.do?idArticle=LEGIARTI000006687625&cidTexte=LEGITEXT000006072665&dateTexte=20100401. Accessed 12 Jan 2017. OECD (2014, December). Focus on inequality and growth. https://www.oecd.org/social/Focus-Inequality-and-Growth-2014.pdf. Accessed 20 Nov 2016.